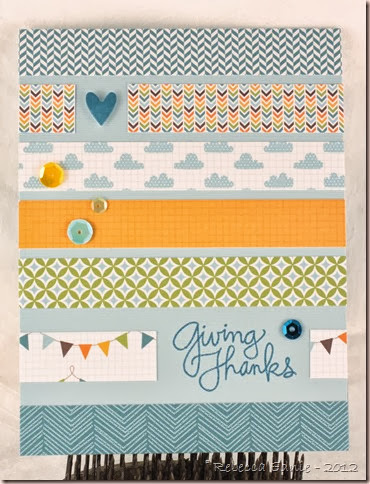 One of my favourite new stamps is this Giving Thanks stamp from the October SSS card kit. I love the font and its such a nice sentiment especially since i make so many think you cards. This was another Retro sketch challenge (84) that I forgot to link up. What is wrong with me? I’ve got to start blogging my cards right away, like the same night! I stuck with the sketch pretty closely just changing the spacing to accommodate the sentiment and not tearing the ends of the strips there there’s a gap. These papers and sequins area really fun. The heart is also a SSS product, their hearts die with all the different sizes and shapes. I’m enjoying making some quick and easy CAS cards with my kits. Its a whole new way of looking at card making and I’m getting some products I’d never choose on my own so its a refreshing change. If you visit for the shabby cards, don’t worry, there will still be plenty of those!